DETROIT, MI [COCC] -- We are very happy to announce that our 2nd Annual "Christ is Born! Glorify Him! 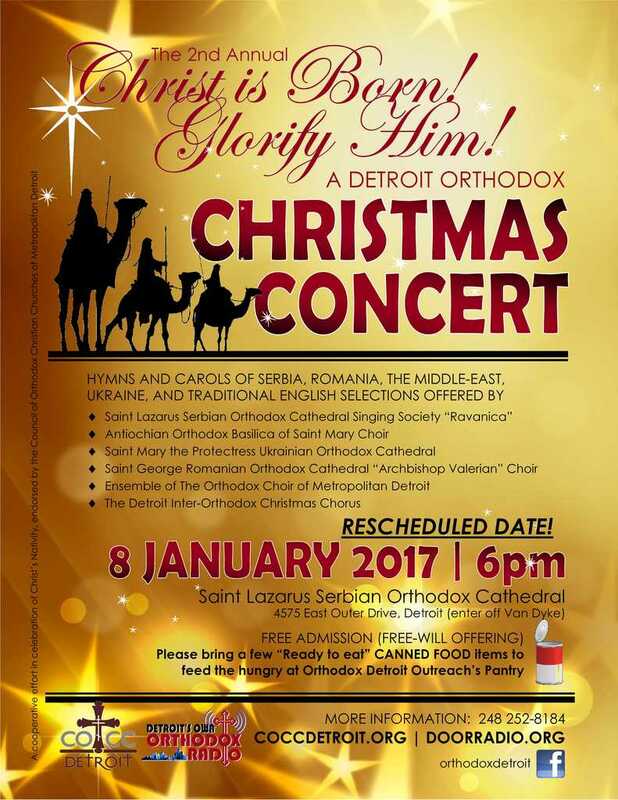 A Detroit Orthodox Christmas Concert" has been rescheduled for Sunday, January 8 at 6:00 p,m, at St Lazarus Serbian Orthodox Cathedral, 4575 E. Outer Drive, Detroit, 48234, at the northeast corner of Van Dyke Avenue. The event was originally to have taken place on December 8 (see previous announcement here), but was postponed at the last minute due to a significant snow storm that day. The host parish and choir, along with our organizing committee have confirmed all necessary arrangements and are thrilled to offer the event fittingly at "Old Calendar" Christmas! The first part of the concert will feature Nativity hymns and carols from the Middle East, Romania, Serbia, Ukraine and other lands sung by selected choirs from local Orthodox churches. The second part will feature English-language hymns sung by an inter-Orthodox chorus and a sing-a-long of popular carols. An afterglow reception will follow. A freewill offering will be collected during the concert to support local Orthodox charities, and attendees are invited to bring canned and non-perishable food for donation to Orthodox Detroit Outreach Community Pantry at Gilbert and Clayton streets. The public is invited to attend the concert. For further information, contact Olga Liss at (248) 252-8184 or Olgaliss0910@gmail.com.